Locksmith Spring: What is a Bump Key? If you’ve been keeping up-to-date with the news, you may have heard about the bump key. 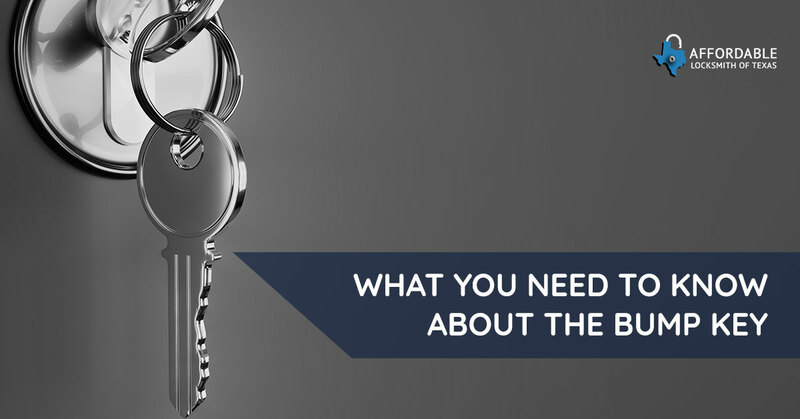 Today, on the Affordable Locksmith blog, we are going to give you the details about the bump key and what it means for your home and business in Spring. Bump keys are keys cut for a specific purpose: allowing quick and easy access to a locked area. A key is considered a bump key when it is cut to the maximum depth of a key-cutting machine. Because the maximum depth is designated as 999, bump keys are also referred to as 999 keys. These kind of keys are incredibly easy to cut and nearly as easy to find. To create the entire bump key you need one more object: a mallet, hammer, or screwdriver. Before we discuss how a bump key works, it is important that you understand how traditional pin and tumbler locks work. Pin and tumbler locks are widely used in both residential and commercial applications. Within each lock are stacks of spring-loaded pins that are set just right so they fit a specific key. When a key is not inserted or the wrong key is used, these pins keep the tumbler from turning and thus your lock stays secure. When all the pins are in proper alignment (i.e. when the correct key is used) it creates the “shear line” which allows the tumbler to turn. A bump key is used when the key is inserted in a lock and a sudden force is applied to the key itself with a mallet, screwdriver, or hammer. When a sudden force is applied to the pins within a pin and tumbler lock, a temporary “sheer line” is created allowing the user of the bump key to momentarily turn the tumbler and unlock the door. If performed correctly, a bump key is effective nearly every time. Key bumping is dangerous for your home or business, not only because it is a highly effective way to gain access to a space, but also because a bumped lock is undetectable. If your home’s lock has been bumped you will never know: there is no sign of forced entry. Because the internet allows for easily sharing information, it is easy for anyone to obtain access to a bump key. To learn more about the benefits of a keyless access system and the possibilities for your home, contact your local Top Rated Local® Spring locksmiths of Affordable Locksmith of Texas.